L: 80" x W: 76" x H: 13.5"
$1,799.00 Select mattress and base options to see price. Serta iComfort Hybrid Blue Fusion 200 Plush King Mattress For a truly peaceful slumber, choose the Serta iComfort Hybrid Blue Fusion 200 plush king mattress. You'll enjoy cool, comfortable sleep thanks to TempActiv™ and EverCool® gel memory foam layers. Plus, a coil support system provides a comfortable sleep surface. For a truly peaceful slumber, choose the Serta iComfort Hybrid Blue Fusion 200 plush king mattress. You'll enjoy cool, comfortable sleep thanks to TempActiv™ and EverCool® gel memory foam layers. Plus, a coil support system provides a comfortable sleep surface. L: 80" x W: 76" x H: 18.5"
L: 80" x W: 76" x H: 22.5"
Breathable memory foam infused with gel designed to provide a luxurious feel and pressure point relief. Dual action gel memory foam infused with millions of TempActiv™ temperature regulating beads to capture, store and ultimately dissipate heat with additional gel for body support. Features strategically placed coils that provide a trifecta of comfort, support and durability from top to bottom. 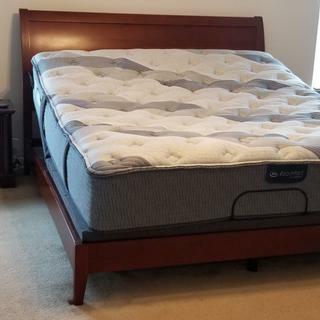 The new Serta Blue Fusion 200 King mattress we purchased from Raymour & Flanigan is thus far living up to it's promise of both a supportive and comfortable mattress. Our hope is the Serta mattress continues to provide the same degree of service and loyalty that we have experienced over the years from Raymour and Flanigan. We brought this after our bed has been sloping for over a year and we couldn’t be happier. I haven’t slept that well in a longgggg time. Definitely recommend a hybrid if you can't find rhe right mix of bed. The Hubs, and I can both sleep comfortably on this mattress. This mattresses has great support but still feels soft. No movement of the mattress when the other person moves. So far very pleased. This bed is really comfortable. I have lower back issues and it's been feeling so much better after getting a new mattress. Very happy. At first it was too soft compared to my old latex mattress, but after a few days on this one, I love it.